ZillaMod – There IS fun in dark horse geopolitical calculations. George Lampman fronted a line of T-Shirts prior to the 9-11 attacks which became memorable before e-bookmarks were that big of a deal. 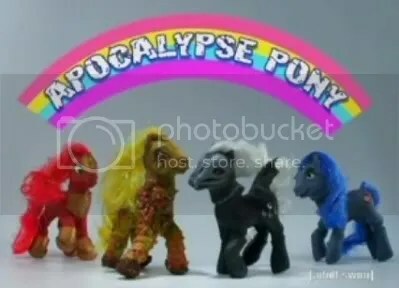 One of interest was the Four Little Ponies of the Apocalypse. From there it got polished …and pretty big. Then, of course, Robot Chicken got a hold of it. A personal favorite … the zombie pony. Oh yeah. This History Channel fanfare would not be complete without the prospect of contact with alien lifeforms, seen below. There always seems to be room for one more dark horse in world affairs scheduled during 2012.